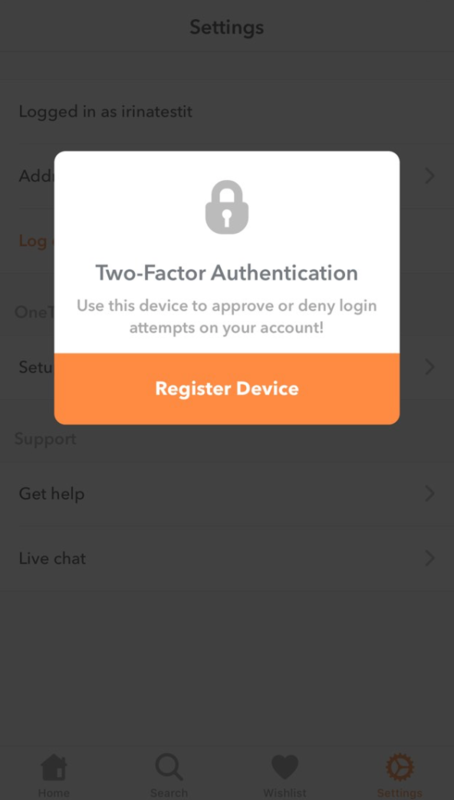 How can I use the OneTouch method for Two-Factor Authentication? Two-Factor Authentication (2FA) adds an extra layer of security to your Namecheap account in addition to your username and password by requiring access to the phone number associated with your account. When the Two-Factor Authentication is enabled, your account cannot be accessed by anyone unauthorized by you, even if they have stolen your password. OneTouch 2FA is the one of the easiest methods to approve your login or password reset requests. You can start using this new feature by installing an updated version of the Namecheap application for iOS (v. 3.6.0) or Android (v. 1.1.4) that supports it. For now, the functionality to use OneTouch with the Authy application is absent. Please note that you can add several devices (for example, phones, tablets, etc.) 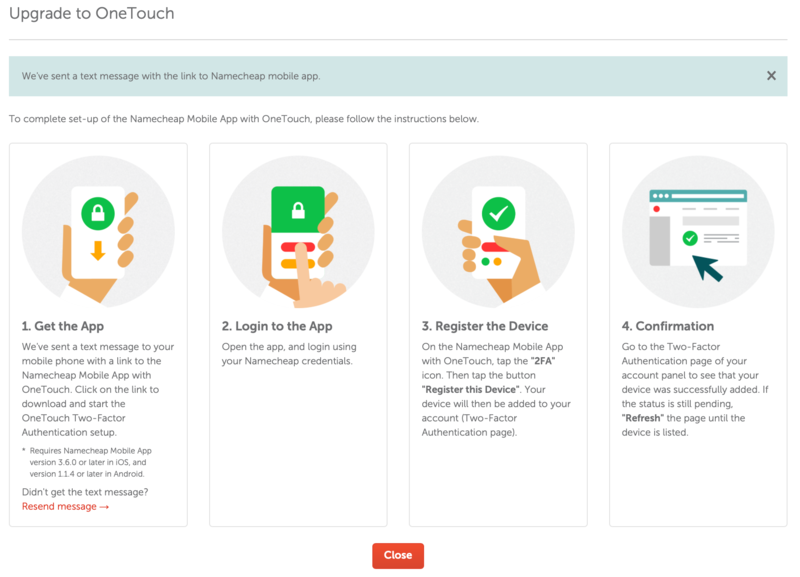 to your Namecheap account to receive the OneTouch app notifications. The same device can also be linked to several Namecheap accounts. PLEASE NOTE: Only the selected phone contact number will be upgraded OneTouch. Your other contacts will be automatically removed. If you have no Namecheap app installed on your device, you will get an SMS with a link to download it from App Store or Google Play. If you’ve got our app already, make sure you are using its new version released after July 10, 2017. You can easily upgrade the application in App Store or Google Play as well. Now open the app and log in using your Namecheap credentials. 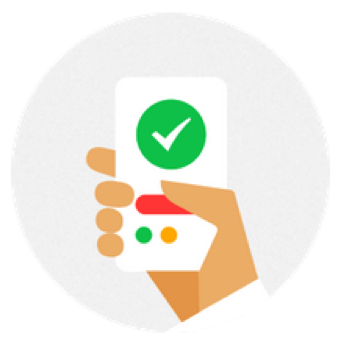 Go through the regular Two-Factor Authentication by entering a security code from the SMS. Just open the app and click Approve there. 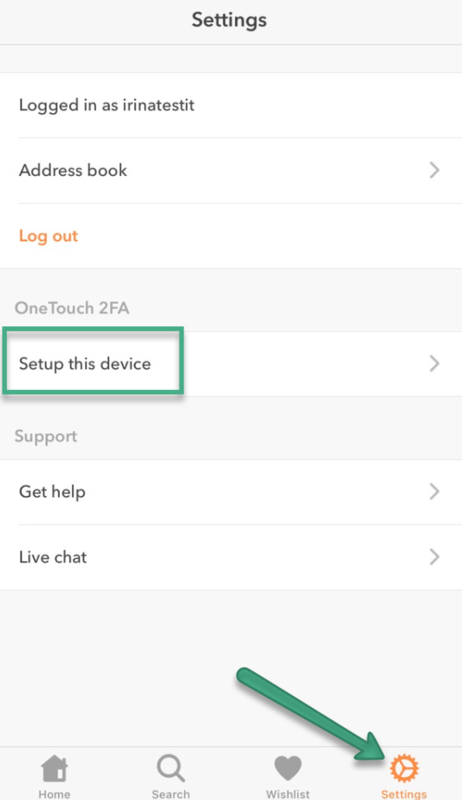 Please do not delete the Namecheap application from the device if it’s used for OneTouch authentication. This can only be done after the corresponding device is removed from your account. If you've lost your phone or changed your phone number, please get in touch with our Support Team to get the access to your account recovered. This is not necessary, though, if you have more than one device added to your account for OneTouch.